There were LOTS of opinions on last week’s gingham ballgown, most of them not complementary I’m afraid. Some of you saw the humour and wit in dress, or appreciated the construction, some of you unabashedly loved everything about it, but it couldn’t bring the overall rating to more than a 3.6 out of 10. There is no clever reason why I picked this week’s Rate the Dress, other than that it is fascinating, and I mistakenly published it briefly last week (sorry about that!). 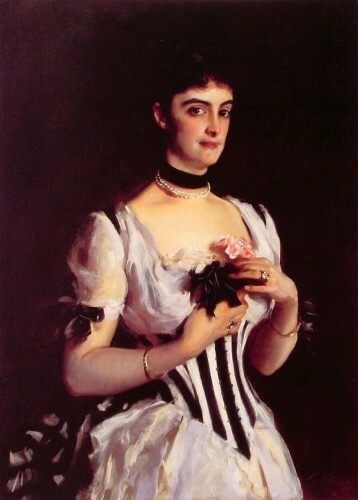 Sargent painted Mrs Wilton Phipps in 1884 with a striking black and white striped waist cincher worn with a coordinating black and white striped bustle and black and white accessories. What do you think? I can see all sorts of reasons to love this ensemble, but equally as many reasons to critique it. It’s got black and white…but so many bows…and does that pastel dress really go…and is the pearl necklace combined with a velvet ribband really working…but OMG black and white striped corset!!!! Which will win out? Rate the Dress (as in everything she is dressed in, and the whole effect it creates) on a scale of 1 to 10. The dress doesn’t go with the corset at all. I’m fine with the velvet ribbon and pearls, and I love all the pieces but the bold stripes of the corset and bustle just don’t go with the dress. So if you want me to rate the outfit as a whole, I guess I’d give it a 4/10. If she was wearing a plain black or white dress, or one with a bolder color choice, it would be beautiful and striking but I find this ensemble rather confusing. I really love it! I love his work, too. I like it all except the velvet choker thing, but… I’ll survive. I sort of see it as a black and white corset paired with a…whitish/off-white dress, so it fits. Just me. 😉 I’d give it a 9.5/10. It is her face that makes it work. On a softer face–say Kate Winslet from 1997, it would fall flat. On her, I give it a 9. Wonderful composition. 9/10. I think it’s lovely. I really, really like it! It looks a tad Steampunk to me. I would totally wear it. I don’t like how she’s wearing the choker with the pearls. It would look much better with just one. Probably just the pearls. But I absolutely love the color scheme, and I LOVE LOVE LOVE black and white stripes. 7/10. I love the waist cincher, but all the bows and necklaces are too much for me, and I’m not sold on the pastel dress. Very pretty shape. Forgetting the colours, the dress is most attractive, and might look even better if you could see the whole thing. I think the dress itself is probably white, not pastel. I have seen quite a few of his pictures (most in reproduction) but his approach to painting white (so tricky) was to use the colours the white reflected. I have one called, I think, ‘A Study in White’, that looks like a study in pastels. If the dress is indeed white, it would be much more striking and sophisticated and less girly try-hard. The lady being a lady, and not a girl. The pearls are a mistake. Okay, there is the black and white thing going, but she should have stuck with the black ribbon. The jewellery as a whole is too insipid (ie small and tasteful!) for the strong black and white. I’ve been looking at this for a while because there’s something bothering me about it, but I can’t quite put my finger on what it is. Love the corset, and the bustle, and the dress, and even the jewellery, but somehow it doesn’t quite gel for me. Mind you, it may just be her right arm – I’m no expert on anatomy, but even allowing for the bend of her elbow I’m sure your forearm shouldn’t be as wide as your neck. I can see the whole “white” thing instead of it being pink. That’s an interesting technique. As far as the dress itself goes, I hate black and white stripes, so that hurts the rating a little. The two colors don’t bother me, even together–I just don’t like them in stripes. Unfortunately, when I imagine the dress without that horrid corset-thing and bustle, the bows are out of place. On the bright side, I love all of her jewelry and other accessories, so that brings it up. I don’t like the dress. It is a bit busy. However, I do like the corset. I rate it 3 out of 10. 10/10. I consider the dress white since using color to depict white fabric is how I learned to do it when I was in art school, and I’ve always loved sargents brush technique to show the luster and drape of the fabrics he painted. This picture reminds me of all the dresses worn in the race scene of My Fair Lady. I love the bold black and white corset and bustle combined with the softer dress, it’s a wonderful way to combine the dramatic and feminine. I like the pearls with the choker for the same reason. And I just love stripes. To me it looks almost as though she’s wearing that striped corset and those accessories with her underwear. The effect is interesting, but rather strange, too strange for beauty. A 6. I really like it! It definitely has a steampunk vibe, but remains still very traditional. Velvet ribbon was a mistake though, she looks decapitated. She looks like she’s wearing her underwear. It really does look like a chemise, corset, petticoat and striped bustle and she’s forgotten to put on her actual dress. I wonder whether there was commentary on this portrait at the time to that effect? I do not like the effect of the choker and the pearl necklace. It makes the choker look like an affectation/pretension. One or the other would be nice, probably just the choker. I actually like black and white stripes, and I do like the idea of this dress very much indeed, although I think the actual realisation is insipid. 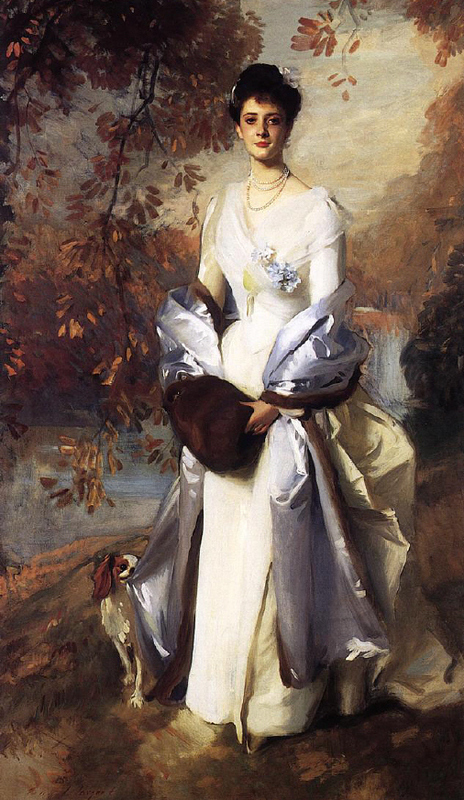 A wishy washy, boring little white slip of dress with a strong black and white corset and bustle overpowering it, redeemed only by a strong wearer – who probably looked rather a lot better in clothes with actual structure, tailoring and fitting – the corset is the only thing about this dress that really suits her. There is a distinct effect of “the wicked stepmother trying to dress like Snow White” about this portrait, which is slightly unfair to the sitter, but she deserved to be painted in a better dress. And I disagree with the people who say that it suits her because she’s angular. I think it’s not nearly angular enough to properly complement her. IMO, it needs curves and softness to fill out the underweary bits, although the wearer would need a vivacious personality to properly work it. It has potential to be quite saucy and charming. The wicked stepmother, a very handsome and good-looking woman in her own right, is trying to dress like a girly ingenue and it’s not quite working. Wow! I don’t think I’ve ever read such strong opinions from you! I still think that it is wonderful on her, with the strips and the color black rendering every flounce more ‘tailored’-looking. Your talk about the evil queen is hilarious–but I like to think that this is Snow White all grown up! I just went back and re-read what I said about THAT dress! I just went back and re-looked at that dress. I need to go wash the cotton candy out of my eyeballs. The corset on the outside made me think of steampunk too! She must have been a daring soul to do that! I’d make that as a steampunk outfit with somesort of dart shooting weapon hidden in the flowers. 8/10. I rate this dress as….WANNNNNNTTTT!!! The white (that looks kind of pink, very French Ooh la la!) and black together are so perfect. LOVE the striped bodice with the black ribbons on the sleeves to pick up the black. The only element I don’t love is the droopy pearls below the black (velvet, I assume) choker. Now, drop pearls sewn an inch apart around the bottom of the choker? Perfection. It really does look like underwear, but nice underwear. It’s hard to see the details with this style of painting but generally I like it, except for the velvet ribbon. The ribbon makes it look like her head is just levitating there. The corset and bustle are gorgeous, I love black and white stripes. This would make a very good Halloween costume. I agree with Daniel et. al about the underwear bit, though I think I’m biased because I’ve been trying to come up with a post about how Victorian ladies don’t wear their corsets (or waist cinchers) on the outside of their gowns, thank you very much Steampunk (nothing wrong with doing it that way for the aesthetic, there’s just [next to] no historical basis). Then again, this may end up as an example supporting that it miiiiiight have happened. As for the ensemble, I think there is too much contrast with the angular, fitted, black and white stripes and the fluffy movement of the pastel dress—they seem at odds with each other. The cincher and bustle over something less floaty would be a definite win, and something without such contrast over the gown pictured would also work, but as a whole, I don’t think this is a good combination. There are actually dozens of examples of women wearing waist cinchers over their outer clothes in the Victorian era in paintings, fashion plates, and extent garments, particularly from the 1860s & 1890s (like this dress). Waist cinchers do look distinctly different from corsets in construction and finish (well, to me, but probably not to the modern random eye! ), so women aren’t wearing corsets over their clothes. Aha, in that case, based on your Pinterest board particularly, I think my understanding of how a waist cincher fit into Victorian fashion was incorrect. On to more research! Yep! Waist cincher vs. Swiss waist vs. Swiss belt vs. corselete is one of the things I’ve had on my terminology to-do list for a while. I’ve got a post started on it, time to pull it out, dust it off, finish and publish it. I have to say I sort of like it in a Tim Burton movie costume sort of way, but as a legitimate piece of clothing not so much. So I am a bit conflicted. Hmmmm…. This is a dress I’ve always loved. But I’m not a fan of pointy-front swiss waists. It’s everything else that makes me love it. This is a 9 for me. One more point – people keep referring to it being a “pastel” dress. I have seen this painting on many screens, but not in person or even a photographic print. I read it as white-on-white stripes, and think it’s great. Do other people think it’s light blue or light yellow or what? I think I’d still like it, but I think white-on-white with black-on-white stripe cincher is just lovely. I read it as a sort of pastel white – pearl or oyster, something very like Carolyn’s dress. It looks white when not paired with other things, but when you see it with a true white (as I imagine the stripes on the corselet to be) you can see how much pink and grey are in the white. But that’s just how I read the painting. I REALLY want to see the bottom of this dress and the back. From what I can see, it’s a total 10/10 for me.